Being a royal comes with many perks. The power, the money, the comforts and the luxury that money can buy. Yes they are all there, but the fact is, being a royal is no child's play - even for the royal children. From the time you wake up, till the time you close your eyes, a royalty's life is governed by rules, rules and more rules and everyone is expected to adhere to all of them. The way you sit, the way you dress up, the way you eat or even the way you greet- everything has rules. There are rules to govern every phase of your life. A very good example would be of Princess Kate, the Duchess of Cambridge, who was a commoner and now a Princess. She is about to deliver her third child and we would like to think that she must be getting spoilt and pampered to bits during her pregnancies because she is producing the future leaders of Great Britain. 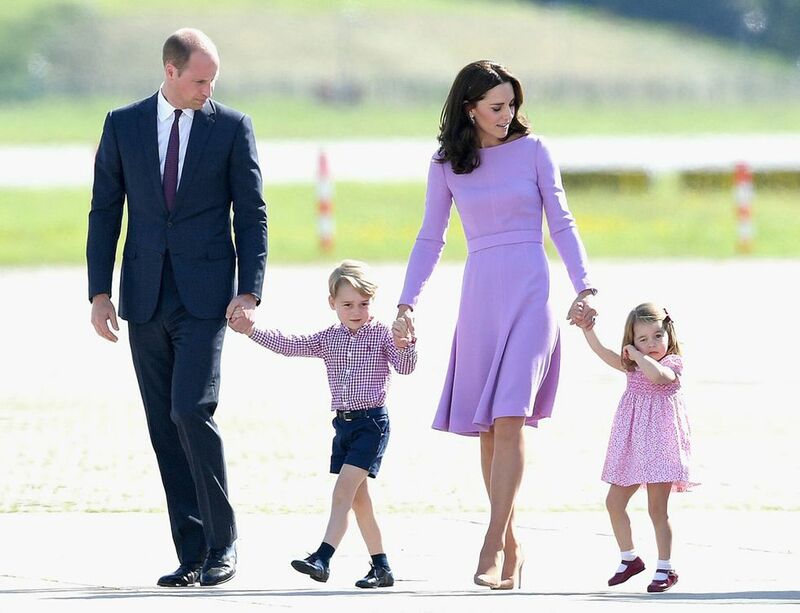 Not only is she performing her royal duties perfectly, she is also doing a great job of bring up her children with the right values and outlook. Even as Buckingham Palace and whole of England rejoices and awaits the birth of their new royal baby, Kate's life is still governed by - you said it - RULES! Here are fifteen rules which Kate is expected to follow during her pregnancy and delivery. There are a few lucky ladies who do not even feel a blip and their entire 40 weeks of pregnancy is a breeze. Around 70-80% of the women go through morning sickness during the first trimester of their pregnancy and it can be managed with dietary changes and a few lifestyle alterations. Then there are those who would just like to delete the memories of those days of food aversion, nausea, and vomiting. They may have Hyperemesis gravidarum - a condition characterized by severe nausea, vomiting, weakness, weight loss and electrolyte imbalance. They need to be hospitalized and treated. Kate Middleton is one such person with hyperemesis gravidarum and requires medical help during all her pregnancies. 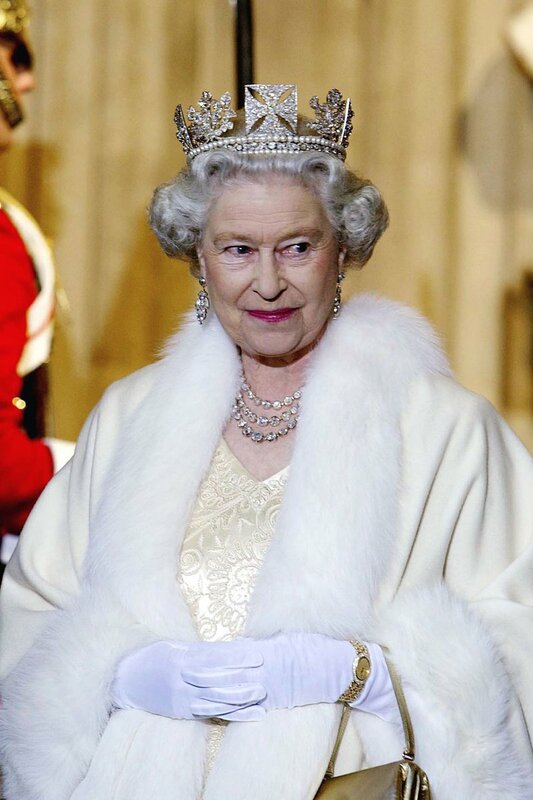 However, being a royal, she is not allowed to take a leave of absence or retire from her royal duties. She is expected to work until her actual due date. Being a Royal surely comes with its pluses and minuses! Morning sickness or no, Kate can never be seen sick or complaining. They say, being a member of the royal family is as good as being an actor on the stage. The show goes on all the time. If you are not up to it, you can fake it most of the time. But pregnancy is a different ball game altogether. There are so many things going on in a woman's body all at the same time and she has no control over it. Physical stress, fatigue, changes in the hormone levels, nausea, vomiting... and the list goes on. And to top it all, if the morning sickness is the hyperemesis gravidarum types, then God save you. You really need excellent acting skills to smile away and put up a show to say "All is well"! This is exactly what Kate needs to do when she goes around performing her royal duties on the days that her morning sickness is bad. Most of us would call in sick at work, but she is made of a different mettle. Most celebrities have a huge baby shower and of course, they get showered with gifts for themselves and for the baby as well. But that's never going to happen for the Duchess of Cambridge. She gets plenty of gifts herself, but she cannot accept any gifts for the baby. Just imagine one of the richest families in the world, the one who has access to the most expensive crown jewels, being presented with a baby gift hamper with baby lotions, oils, creams. powders and shampoos or bags of diapers! In fact, the royal parents to be, are not allowed to buy anything for the unborn child. It goes against the rules. But I wonder if she misses all the fun and excitement of a baby shower though. The above photo was created by famed photographer Alison Jackson using look-a-likes of the Kate's nearest and dearest ones. The scene depicts what the Royal baby shower might look like, especially if the Queen decides to drop in. Her mother-in-law Camilla, her own mother Carole and younger sister Pippa are shown as well. That one is an absolute no-no! The royals have protocols to announce the arrival of the new born baby; after all, this is no ordinary citizen we are talking about - it is the future King or Queen of England. Moreover, the royals love to keep the people in suspense. The announcement of the pregnancy is made by the Buckingham palace, and from that time on, till the actual delivery, all of England and people around the world and the media get into a frenzy of guessing and betting and speculating on the gender of the child. For the next few months, everyone will keep their eyes on the Royal Princess, looking for signs and hints to see if their guess is right. It is a very interesting way to keep the people on their toes! The moment we hear of a celebrity who is pregnant, soon enough, the internet is flooded with pictures of them with their belly shots. But for a royal, that is not the case. They cannot be seen in bikini shots, flaunting their baby bump. Kate did a very good job of keeping up with that rule. Yes, we all know that she is very confident of her body and looks amazing in anything she wears. But during her pregnancy, she is expected to adhere to the pregnancy wardrobe rules. Even if it is a sweltering 90 degrees outside, Kate Middleton can never be seen in a summer dress, tank top and shorts or showing some skin. Following pregnancy wardrobe rules are a must and there are no exceptions. We have seen that Kate does a lot of charity work for children and is also required to travel along with Prince William during his official tours outside London and state trips abroad. We also read earlier that she is not allowed to take prolonged sick leave on account of her pregnancy. However, there are a few places where she is allowed a little slack during this time. During pregnancy, Kate is expected to stay closer to home. She cannot travel too far away or fly abroad. This is because the Queen would not like to take chances with Kate's pregnancy. In case of emergency, help will be at hand. Kate, however, is determined to prove that she can be a working Mom too; that she can take care of her health, her children and do her bit in every possible way - after all, women all over the world are looking up to her for inspiration. Hmm... Does she really need to? She can have anything delivered to her doorstep at any hour of the day! It is not like she really needs to drive herself around to get things done. Of course you would see pregnant women behind the wheels... but that is for us commoners. Royals are always driven around all the time. 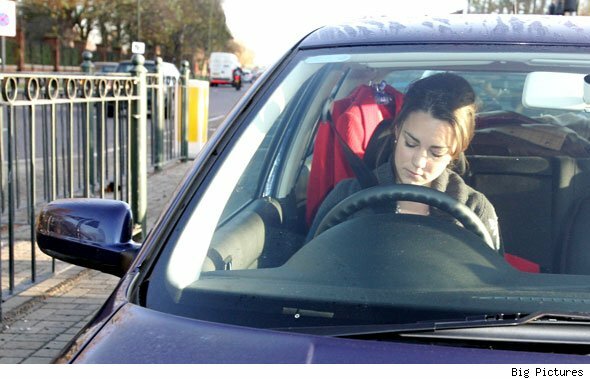 They are not allowed to drive anyway- except for the Queen, who loves to break this rule once in a while. Prince William too loves his motorbike rides. But as for Kate, she is the Buckingham Palace's most prized possession, who is carrying the future Monarch of England. But when you have an entire fleet at your beck and call, why on earth would you bother driving?! Moreover, who wants to be bothered with the traffic? But no, during her pregnancy, she cannot be seen shopping. The last thing the Queen would want to see is Kate giving away major hints during this time. People and paparazzi, all eyes will be on her, trying to figure out the month she may be in going by her choice of size of clothes or the gender of the baby going by the colour - is she seeing pink or is it all blue? Or is she carrying twins? Phew... Hang on Princess, tailor made suits are the thing of the day for the next few months... your shopping-binge will have to be put on hold for now. Actually, Kate cannot be seen doing much in public other than her official assignments and royal duties. So she may not really need to shop for too many clothes anyway. This is a tradition which has lasted for centuries. Queen Elizabeth gave birth to her children in their Clarence house just as she herself was born in her London home. Midwives took care of the delivery and the delivery has to be "witnessed" - earlier by the public, but later it was just the secretary of state and a few other people - just to ensure that the baby is not swapped and the heir to the throne did come from the royal womb. And guess what? No anesthesia or painkillers whatsoever!! Pain relief for the woman in labor was rare those days. In an era where there were no Gynecologists or Obstetricians, midwives managed the show beautifully. Even as medical science evolved and good hospitals did come up, the British royals continued this tradition up until Princess Diana put an end to it by giving birth to both her sons Prince William and Prince Harry in the private Lindo wing of St. Mary's Hospital, Paddington. This is the same place where Kate gave birth to Prince George and Princess Charlotte and her third baby will be born soon. Who would think that the future Queen of England will have any dearth of helping hands? For both her previous deliveries, Kate had a fleet of helpers to assist her. The Duchess of Cambridge had a backup team of more than twenty doctors and nurses which included two obstetricians, three midwives, three anesthetists, four theatre staff, two special-care baby unit staff, four pediatricians, one laboratory technician to check blood samples, and four senior managers. Phew... that's an entire battalion there! Since she had two positive experiences in the St. Mary's Hospital, Princess Kate is confident that she is in safe hands , according to The Telegraph. A room is already booked in the Lindo wing and the team is ready. They are just waiting for the baby to arrive. Sources said that the staff in Kensington Palace is sprucing up the nursery to welcome the new baby. In the olden days, the father of the baby was not allowed in the birthing room the Queen is the first to know about the birth. Well, Prince William has twisted that rule a bit. Sources said that during the birth of Prince George and Princess Charlotte, he had taken up a room in the hospital and was right outside the birthing room. He was also the first to know about the birth. He then called up the Queen and gave her the good news, before calling up Prince Harry, the Middleton family and the rest of their relatives. They also broke tradition by resorting to modern methods of communication. The birth of both the children were announced to the world through Twitter. So the media and their keen fans all over the world think that they will do the same third time around. Now wouldn't that be really funny sight these days to see a "town crier" all dressed up in traditional clothes, ringing a bell in one hand, a scroll in the other, shouting out the news about the birth of a royal baby! Well that was the method of communication in the olden days when the subjects could not read or write. People would gather around as soon as they heard the bell ringing; the town crier would announce the birth to all who gathered and then move on to the next location. Britain celebrates the birth of every royal baby irrespective of their position in the line to the crown. The baby gets a 62 gun salute from the Tower of London and another 41 gun salute from Green Park near the Buckingham Palace. Now that is called a grand entry into this world! These guns are not the normal modern day guns that we imagine. These are the age old guns, on wheels. 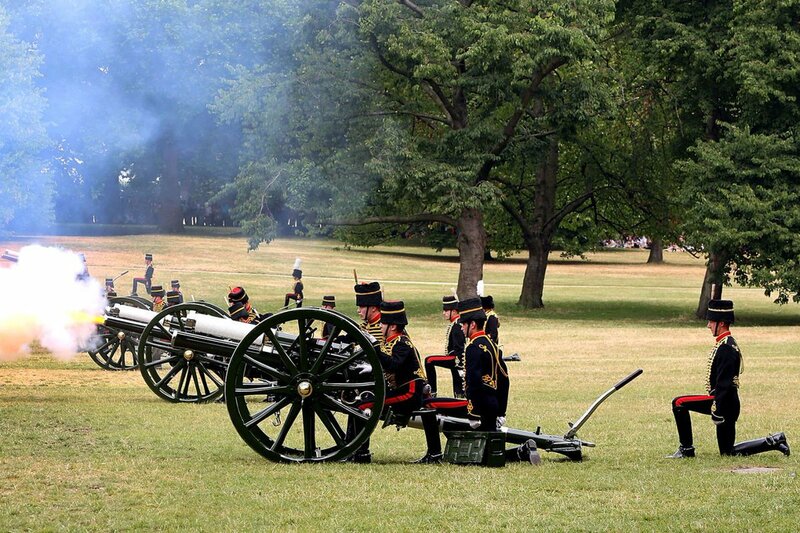 The bells in the Westminster Abbey also ring a full peal to coincide with the gun salute in Green Park. The complex peals lasts for 3 hours. It is time again for William and Kate to choose a name for their third child. In the case of their first and second child, they took more than two days to announce the names. 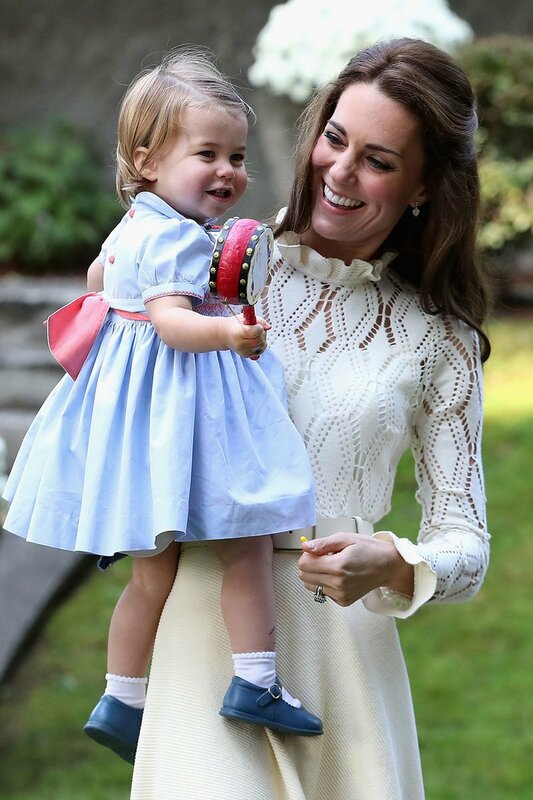 According to the Hello Magazine, "The key consideration when naming a royal baby is the fine balance between tradition and accessibility, The Duke and Duchess of Cambridge will want the fifth-in-line to the throne to bear a name worthy of such weight, and it's therefore likely they will choose a solid, traditional name with strong links to royalty. At the same time, they won't want to appear old-fashioned or haughty, so choosing a name the public can embrace is equally important.They are required to have least three or four names for the child. Interestingly, before the 20th century, the British royals did not have a last name. But Queen Elizabeth and Prince Philip wanted their line of the family tree to be distinguishable. Their descendants would now carry the last name Mountbatten-Windsor. So going by that rule, here is Prince William full name - William Arthur Philip Louis Cambridge Mountbatten-Windsor. How's that for length?! And to top it all, for all official purposes, their titles are also added behind their names! Imagine the plight of their class teacher while she takes the attendance everyday...! Thankfully, in school they are just called by their first names- for example, Prince George's full name is George Alexander Louis Cambridge Mountbatten-Windsor, but in his school, he is registered as George Cambridge. According to the Daily Mail, Baptisms are a must for Windsor babies thanks to the Queen's role as Defender of the Faith and Supreme Governor of the Church of England. Royal infants are often welcomed into the Christian faith within weeks of being born - in Charlotte's case, just over two months after her arrival on the 2nd May. George was three months old at his, while William was baptised on August 4 1982 at the age of six weeks. 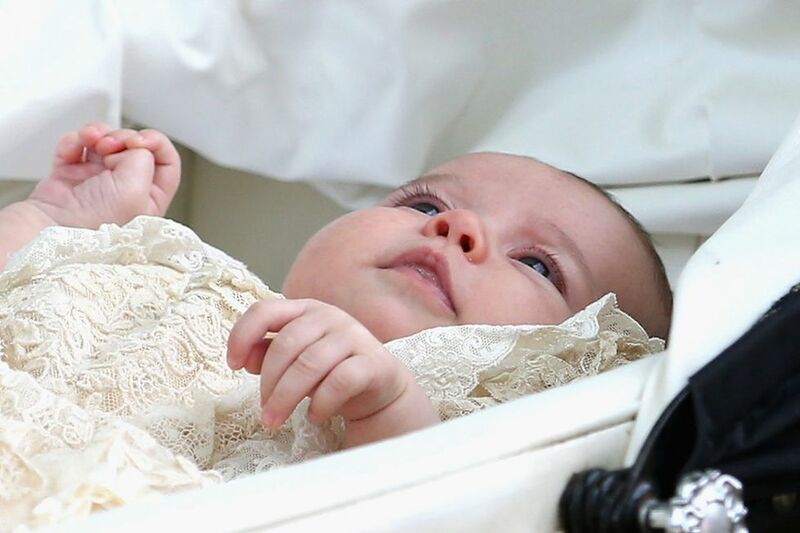 But the most interesting thing about the Windsor babies' christening is the Christening Gown. The Honiton Lace Gown was first made in 1841 for the christening of Queen Victoria's first child. Since then all the babies have been baptized in that very same gown, up until Lady Louise Windsor in 2004. Sadly due to deterioration that gown had to be preserved and in 2008, a replica was made, which is being used for all the babies born since. Let us really hope that between all that horrible nausea, vomiting, royal duties, and shopping restrictions, Kate enjoys this journey into motherhood and parenting. After all, her primary responsibility is to nurture and bring up the next generation and the future leaders of England with the right values.